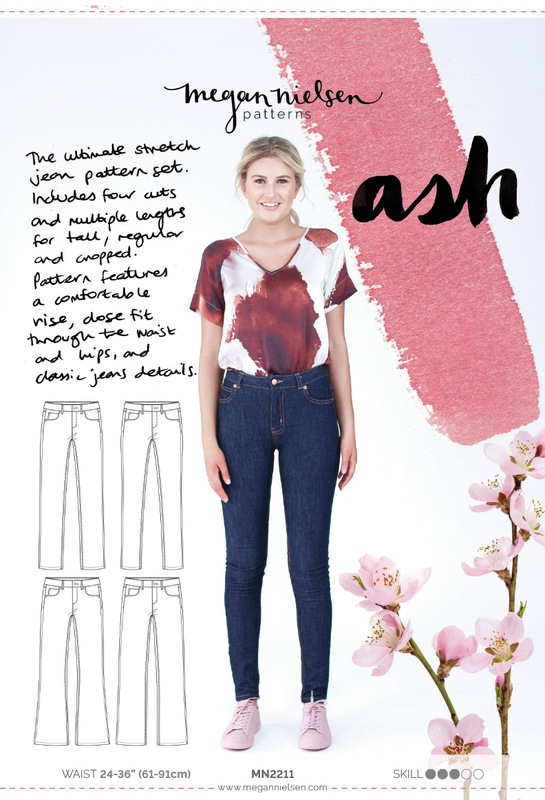 Ok, lets dive right in to our Ash jeans construction! Whats great about this pattern, is that the sewing steps are exactly the same for all versions. So no matter what leg style you are making, everything in this sewalong applies! Another great thing about it? You get the scariest step out of the way first! Yeah, the fly front is a little intimidating, I know. Because I was intimidated by it too at first. But I promise, it really isn’t as bad as you think. After I was done, I couldn’t believe how easy it was. And then the rest of the construction felt like a breeze after that. So don’t be scared. Let’s get right to it, and you’ll see, too! 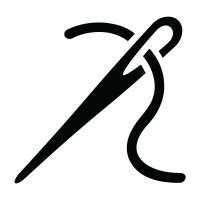 And remember, you’ll need to switch between regular thread and topstitching thread, and a regular foot and a zipper foot. So make sure to pay attention to that! 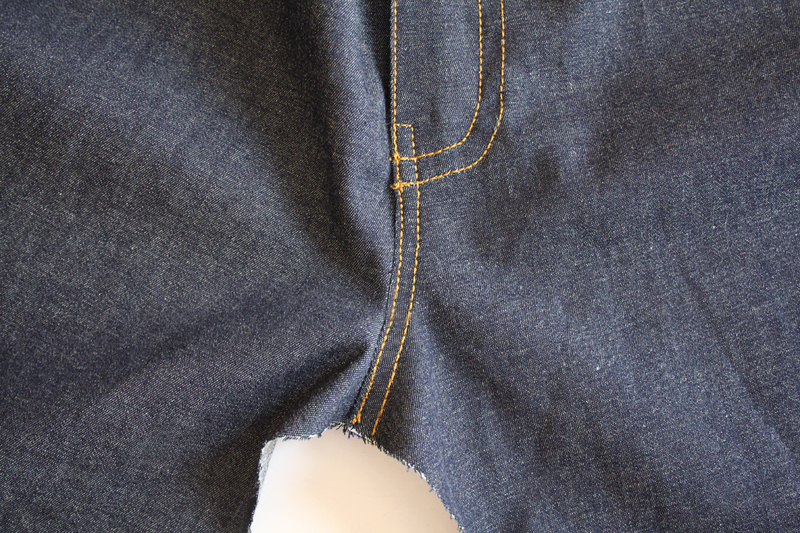 To start, we need to finish the raw edges of the front crotch with your preferred method. 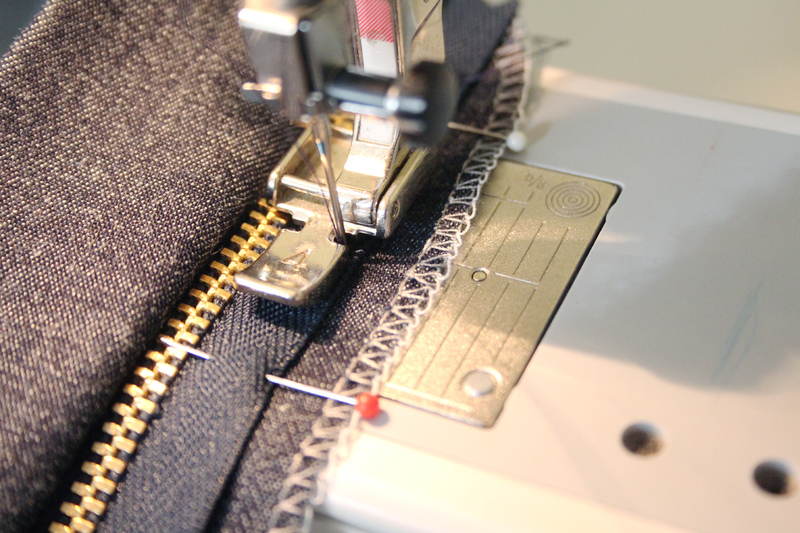 You can use a serger, zig zag stitch, pinking shears, etc. 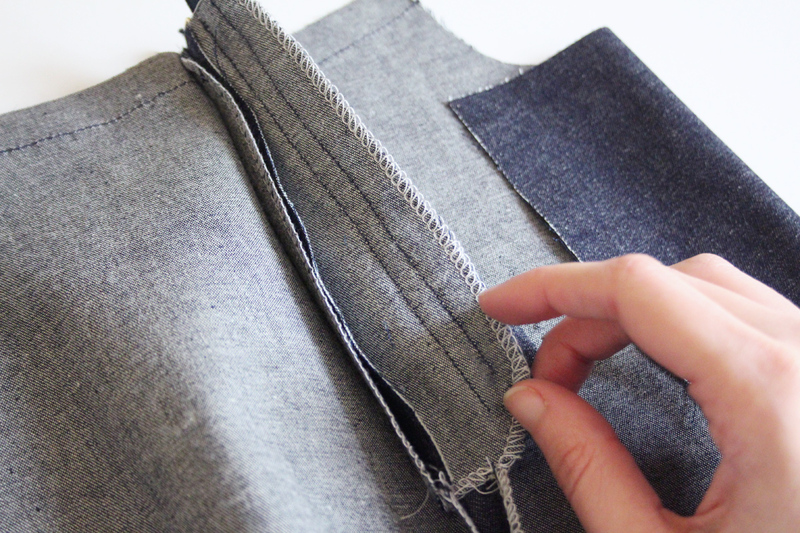 But if you use a serger (like above), make sure you are inly finishing the edge, and not trimming off any of the seam allowance. 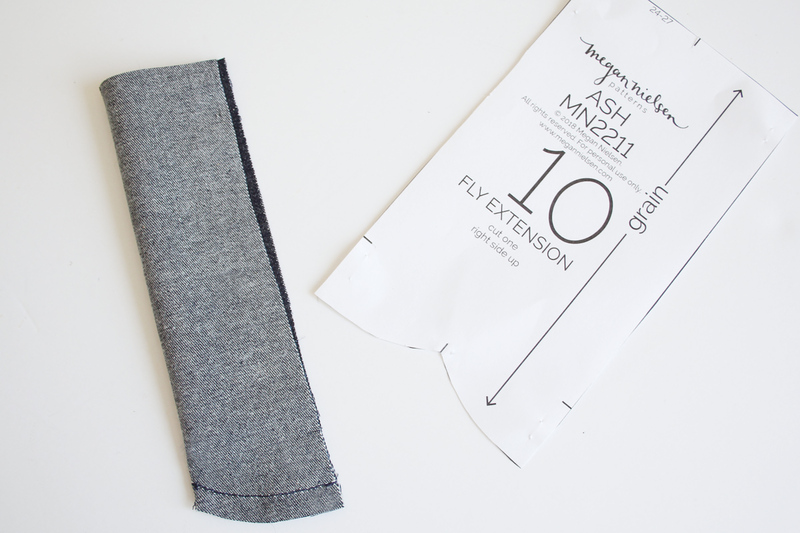 Fold the fly extension piece in half with right sides together. 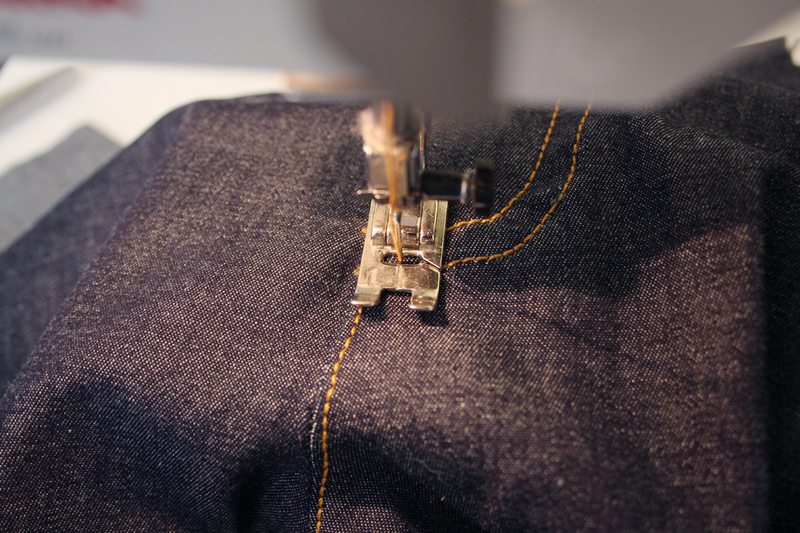 With regular thread and presser foot, sew along the bottom curved edge 1/4” inch from the raw edge. Turn the right way around, shape the curved edge and press. 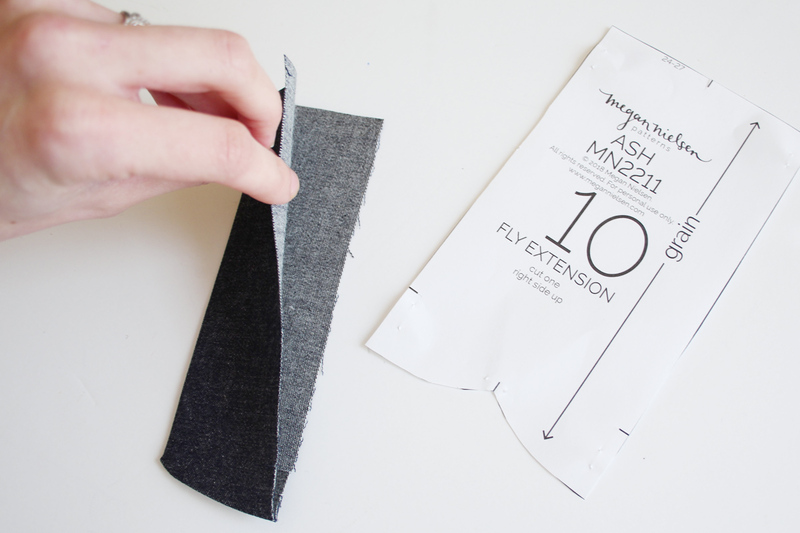 Finish the raw edge of the long side of the fly extension (two layers of fabric), as well as the curved side of the fly (one layer). 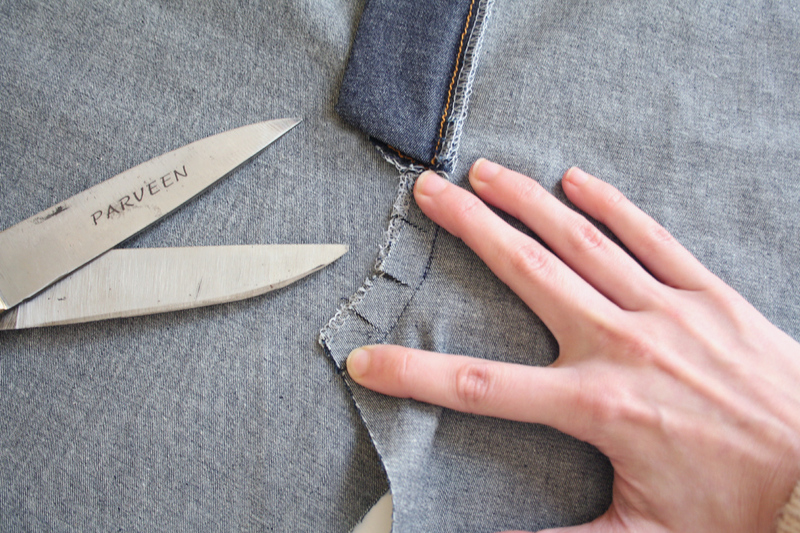 Again, you can use a serger, zig zag stitch, pinking shears, etc. 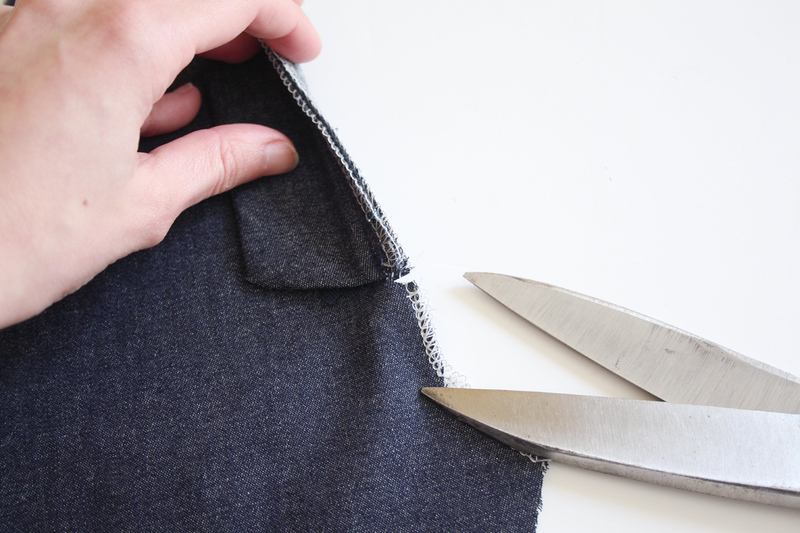 But if you use a serger (like above), make sure you are only finishing the edge, and not trimming off any of the seam allowance. 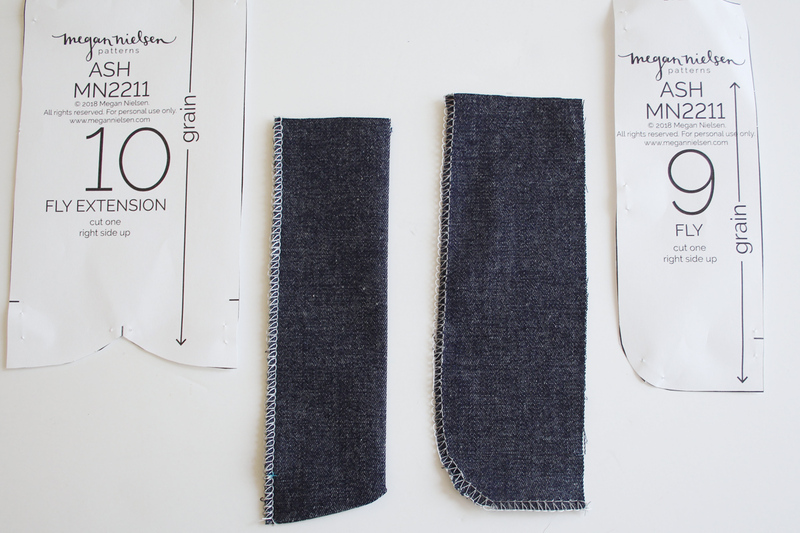 Place the fly extension down so that the folded edge is on the right and the finished longer edge is on the left. Place the zipper down, right side up, along the left side, so that the zipper stop lines up with the notch on the fly extension. Pin in place. 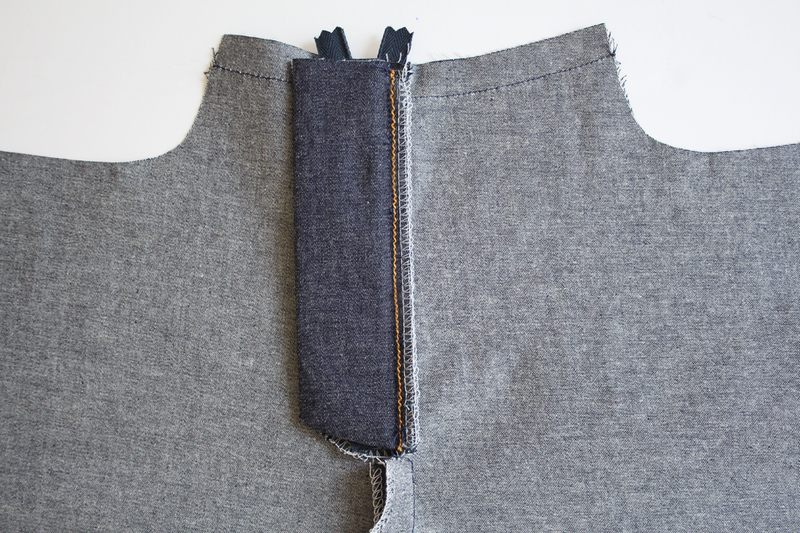 If your zipper is longer than the suggested length, please do not worry! We’ll show you what to do about that when you attach your waistband. For now make sure you line up your zipper stop with the notch, and let any additional zipper length stick up over the top. Switch to a zipper presser foot. Sew in place 1/4” from the edge. Now place the right front piece in front of you right side up. 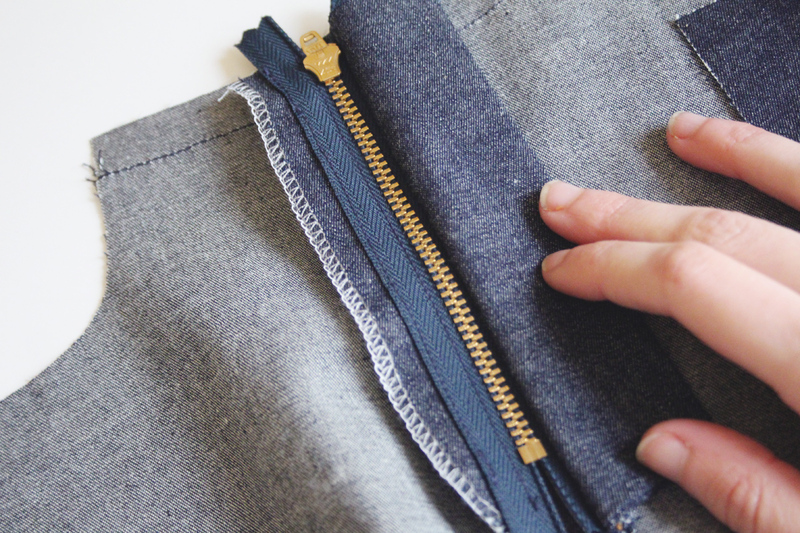 Grab the fly extension/zipper – with the right side/zipper facing down, place it along the crotch edge, lining up the finished edges. Make sure the notches are matched up. 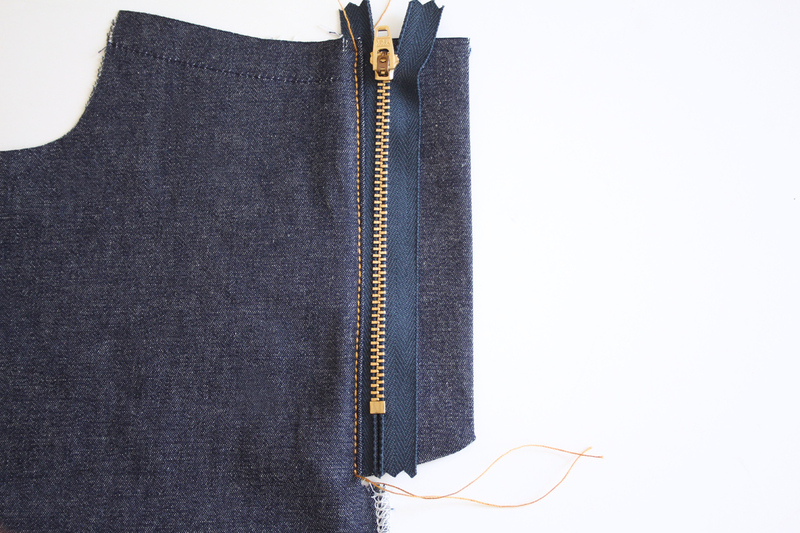 The zipper is now sandwiched between fabric. 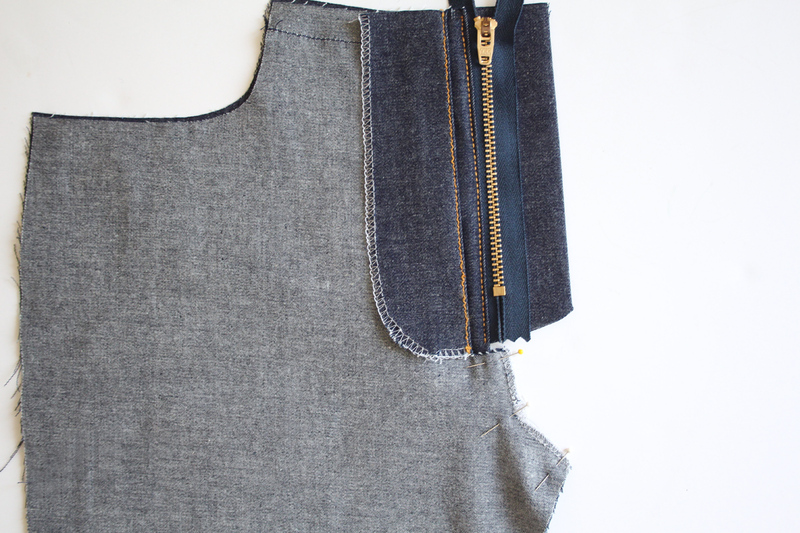 Still using a zipper presser foot, sew 1/4′ from the crotch edge along the entire length of the fly extension. Clip into the seam allowance just below the fly extension by 1/4”. Flip the fly extension around so that it is also right side up. 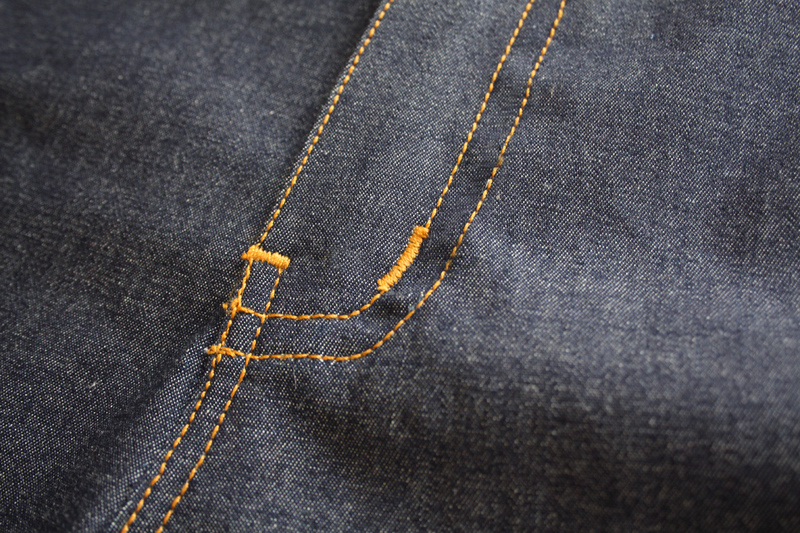 Still using a zipper foot, switch your thread to topstitching thread, and topstitch on the front piece 1/16” from the seam. 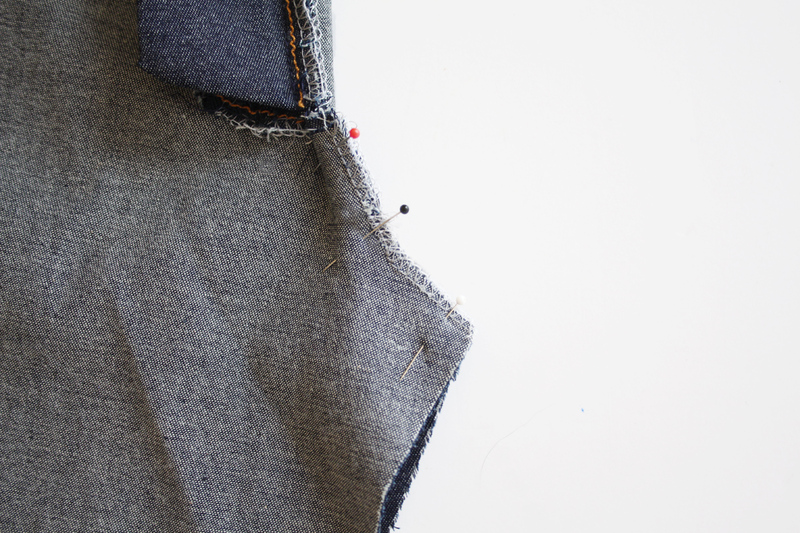 Don’t backstitch when you topstitch. Instead, use a needle to pull the top thread to the back and knot. Now place the left front piece in front of you right side up. Put the fly piece on top, right sides together, lining up the straight edges. 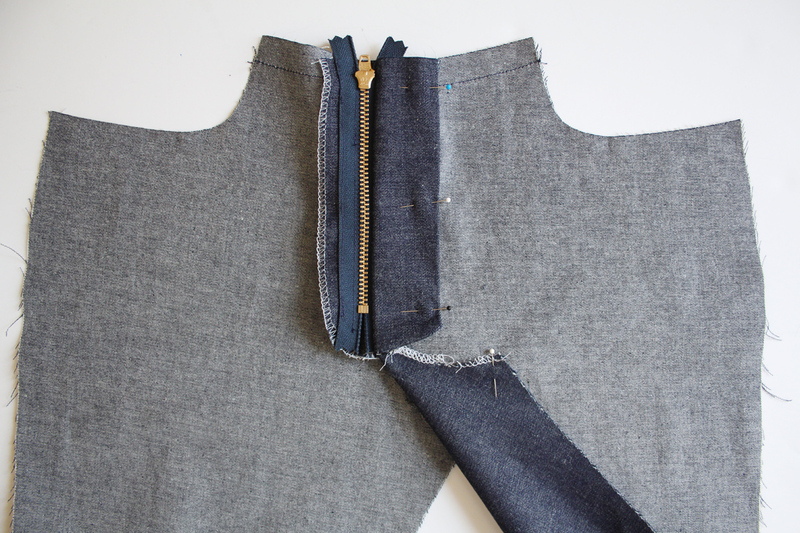 Make sure the crotch notches are matched up, and pin in place. 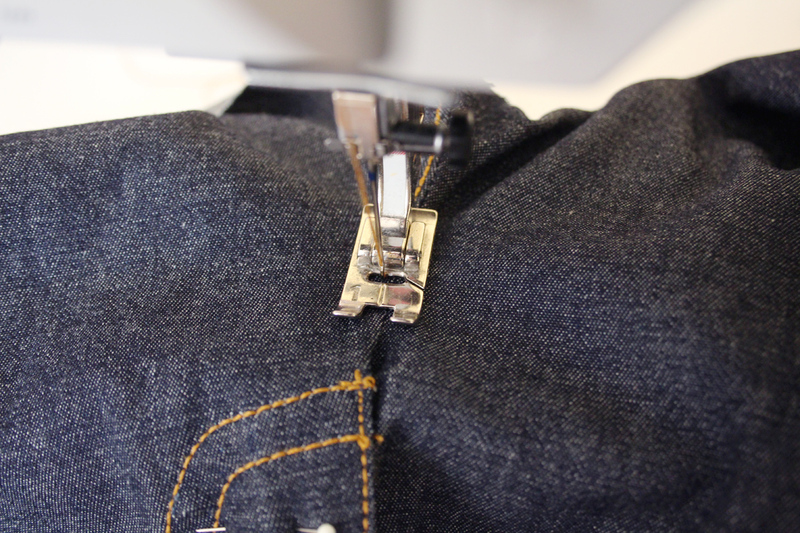 With a regular foot and regular thread, sew 5/8” from the edge along the length of the fly. Clip into the seam allowance 5/8” in, just below the fly. Turn the fly around to the inside and press so that none of the fly is showing from the right side. Keep your regular presser foot, but switch to topstitching thread. On the right side, topstitch 1/16” from the edge. 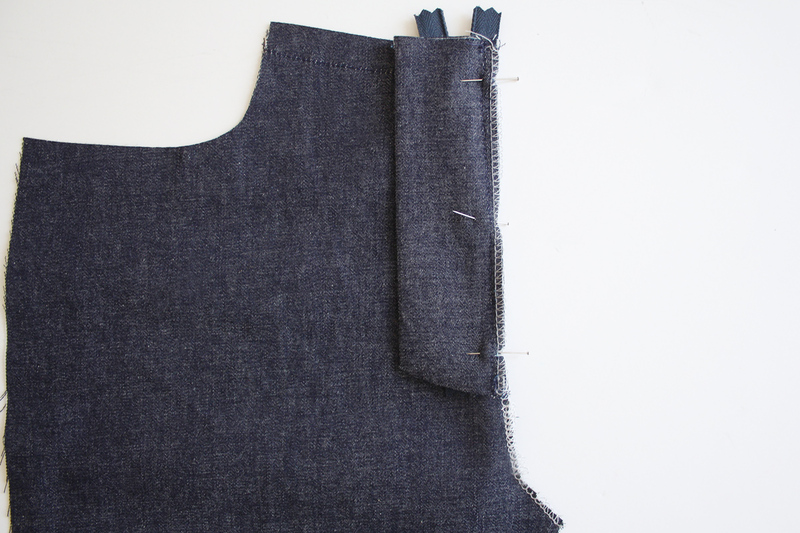 Don’t backstitch, instead bring your top thread to the inside and knot. 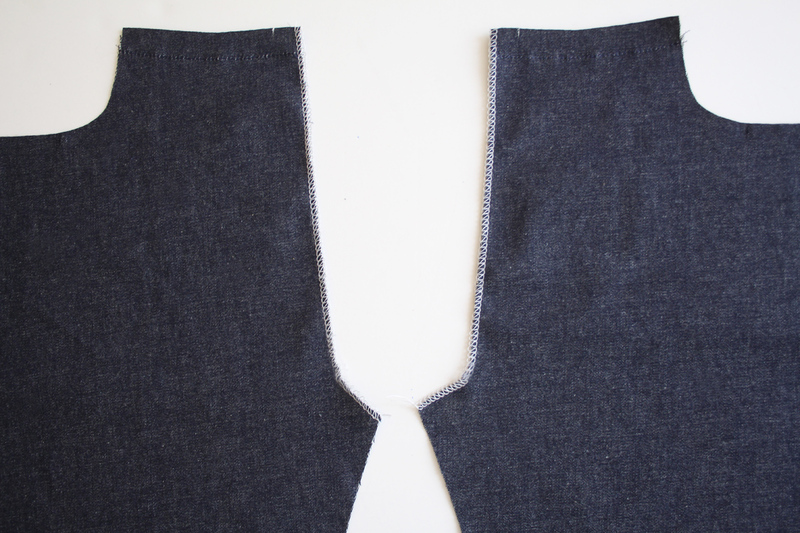 Put the two front pieces together with right sides facing each other, lining up the crotch seam. Pin in place, and just baste together the crotch seam below the zipper with regular thread, 5/8”. Open up your front. From the right side, overlap the fly over the zipper and fly extension. The folded edge of the fly will line up with the center front. Theres a notch at the waistline indicating this. Pin in place. Flip over so the wrong side is now facing you. Move the fly extension out of the way, so that you can see the backside of the zipper on top of the fly. Pin the zipper to the fly ONLY, not to the front piece too. The edge of the zipper tape should be the same distance from the edge of the fly all the way down. See, pinned to the fly only. Switch back to a zipper presser foot. 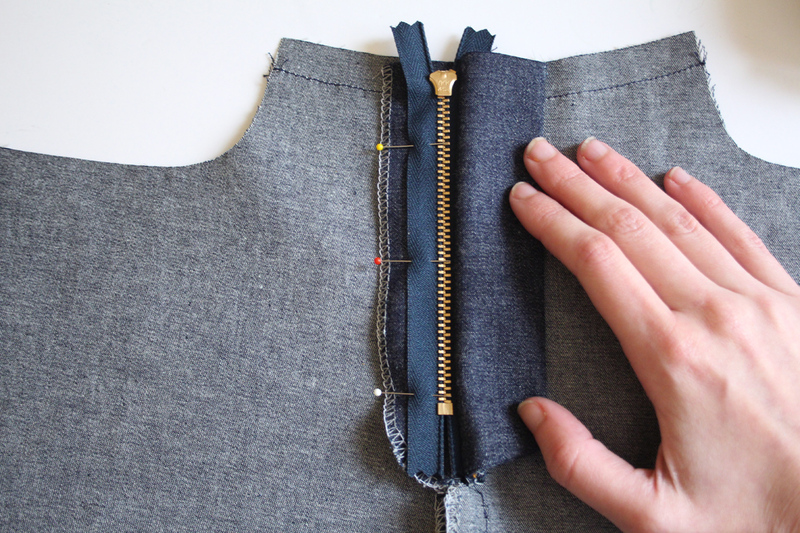 Using regular thread, Sew the zipper to the FLY ONLY. 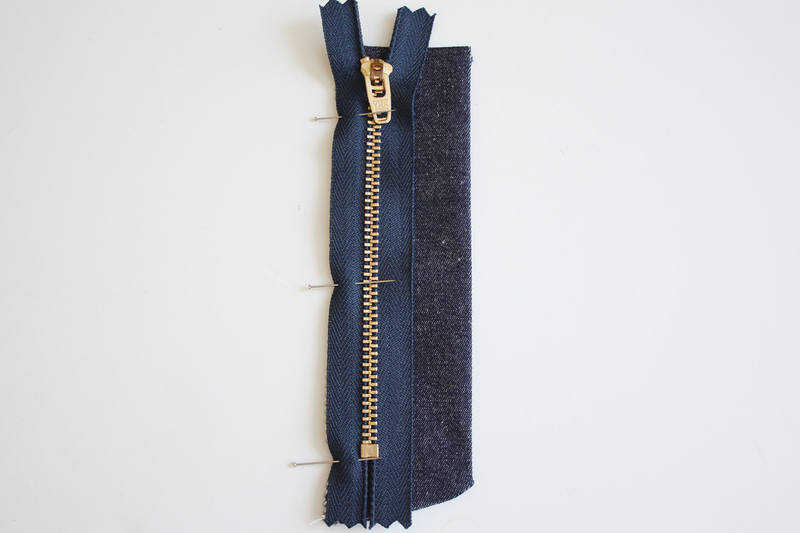 Sew a line of stitches 1/16” from the zipper tape edge, and another line about 1/4” away – close to the zipper teeth. Again, you’re only sewing to the fly only. This is what it will look like from the other side of the fly. 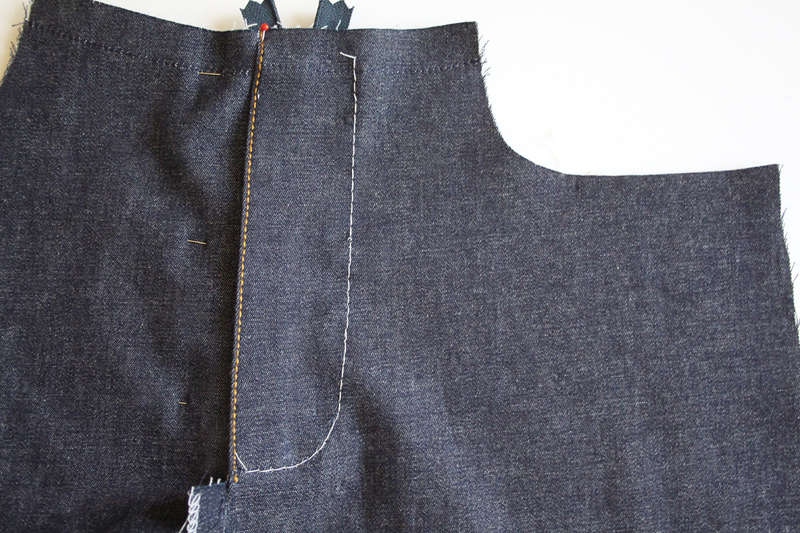 Now unpick the basting stitches at the crotch seam, and pin the right crotch side out of the way. Pin the fly extension open and out of the way to the right. We’re moving all of this out of the way so that we don’t catch any of it while topstitching in the next step. Using regular thread, preferably a contrasting color, baste around the outer edge of the fly from the inside. You’ll be basting through the fly AND the left leg side. 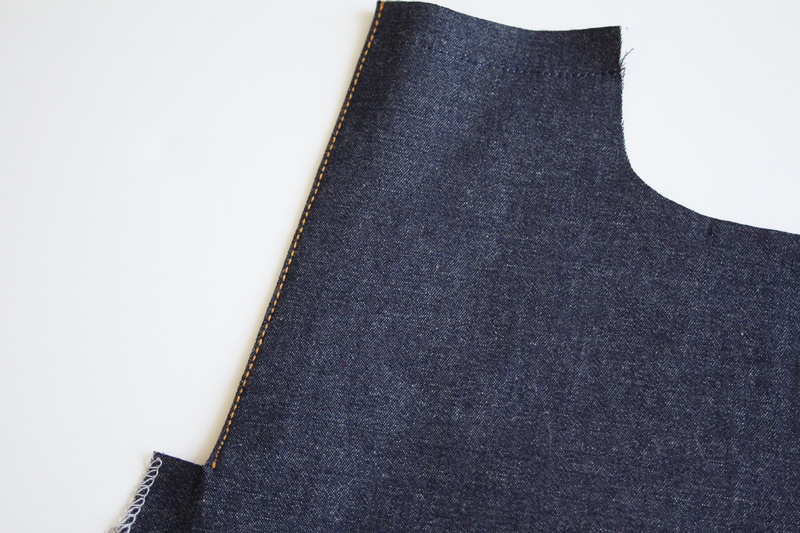 When you turn around to the front, this basting will act as your guide for topstitching. Switch to your topstitching thread. 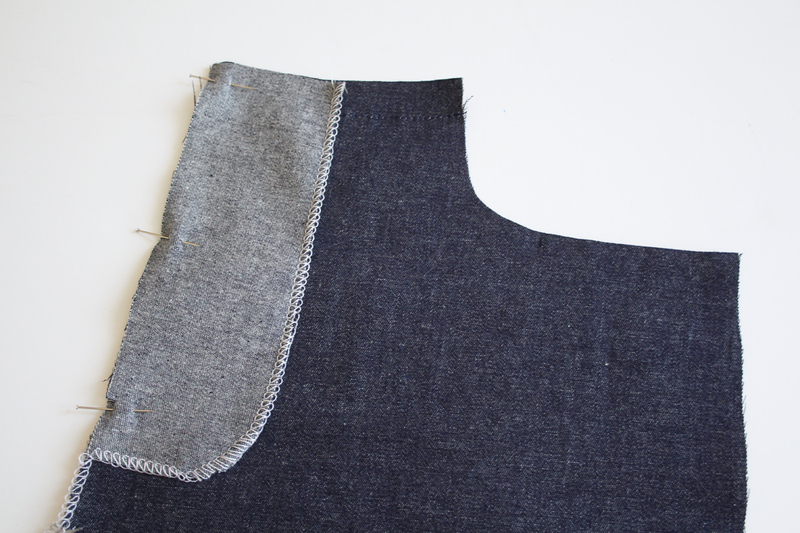 Using a regular foot, topstitch along your basting stitch guide. Go slowly! 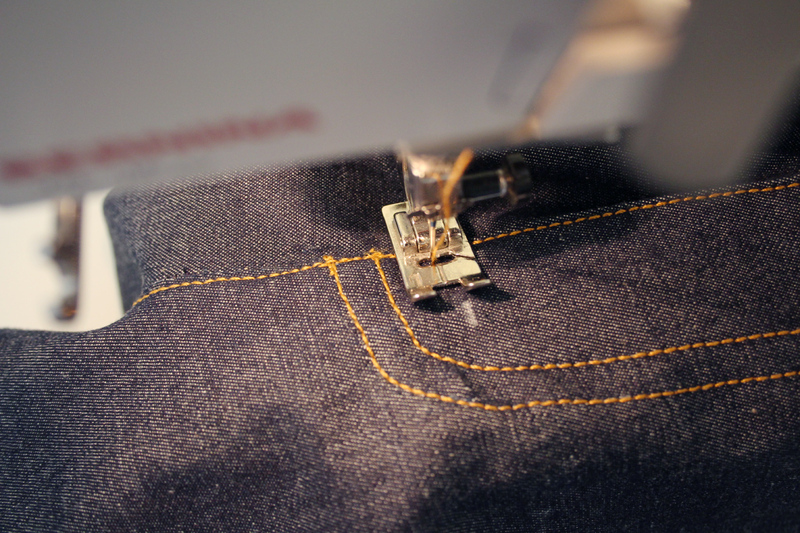 This topstitching is the most visible part of your jeans. You want it to be as neat as possible. Sew another line of topstitching 1/4” away from the first line. Do not backstitch with these. Rather, use a needle to bring the top thread to the inside and knot, as usual. 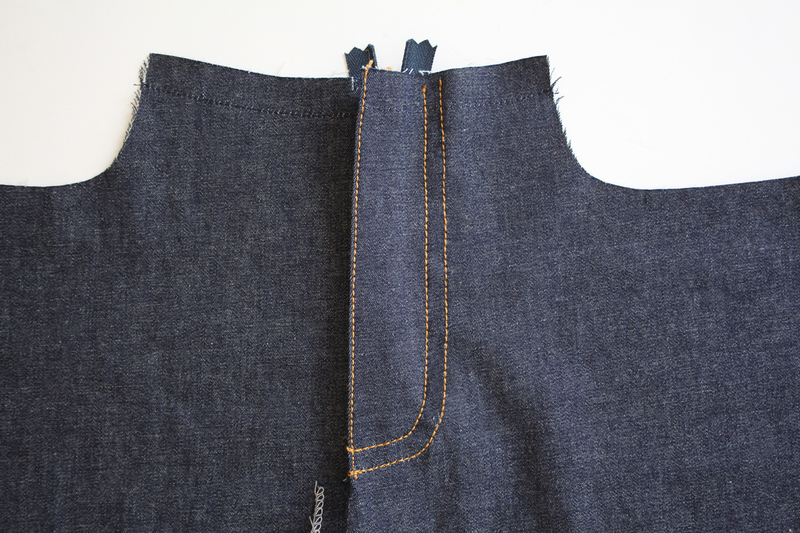 You can now unpick the basting stitches and unpin the fly extension and right crotch. Once again, pin the crotch area together with right sides facing each other. Pin in place. Sew together 5/8” from the edge using regular thread, getting as close to the fly/fly extension as possible. 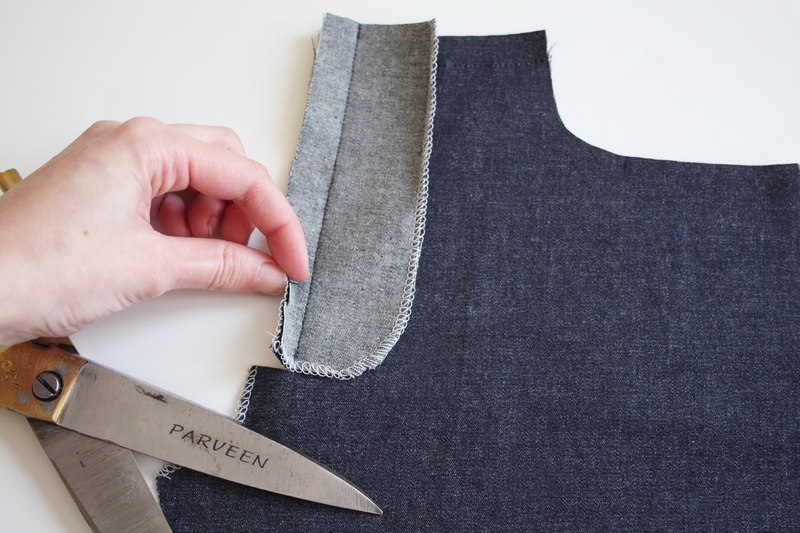 Clip into the curve of the seam allowance and press towards the left side. Now turn it around so that the front side is facing you. Remember, the crotch seam should now be pressed to the left leg. From the outside, mark where the bottom of the zipper stop is. You can use a pin or tailors chalk. Switch again to topstitching thread. 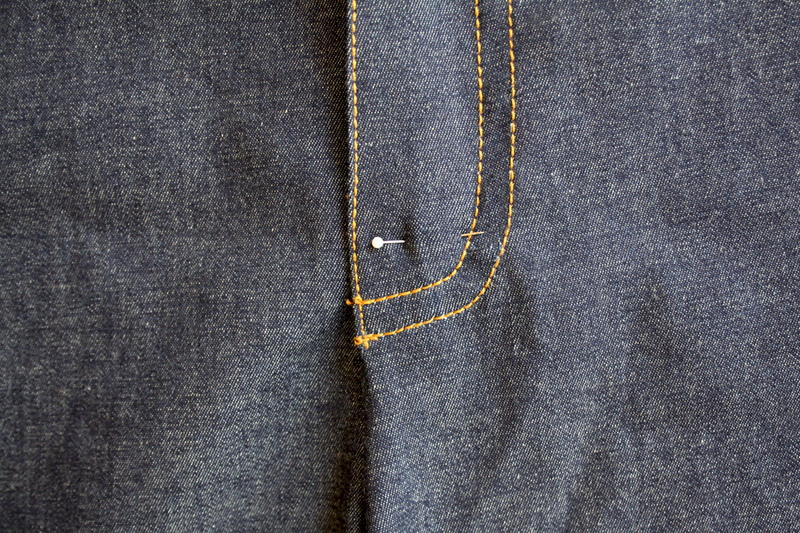 With a regular foot, topstitch along the crotch on the left leg/fly side, 1/6” from the seam. Start from the bottom of the crotch and go up towards the fly. 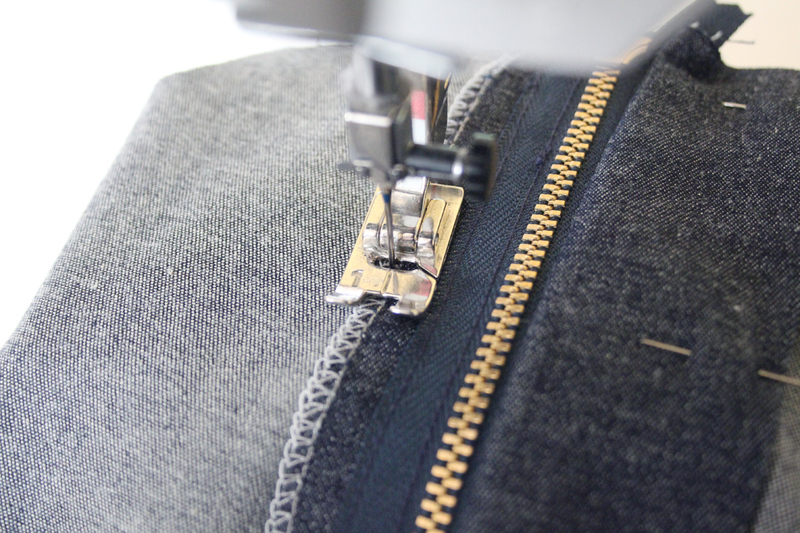 When you reach your mark at the bottom of the zipper stop, pivot and sew across 1/4”. Then pivot again and continue topstitching parallel to the first line of topstitching, back down towards the end of the crotch. 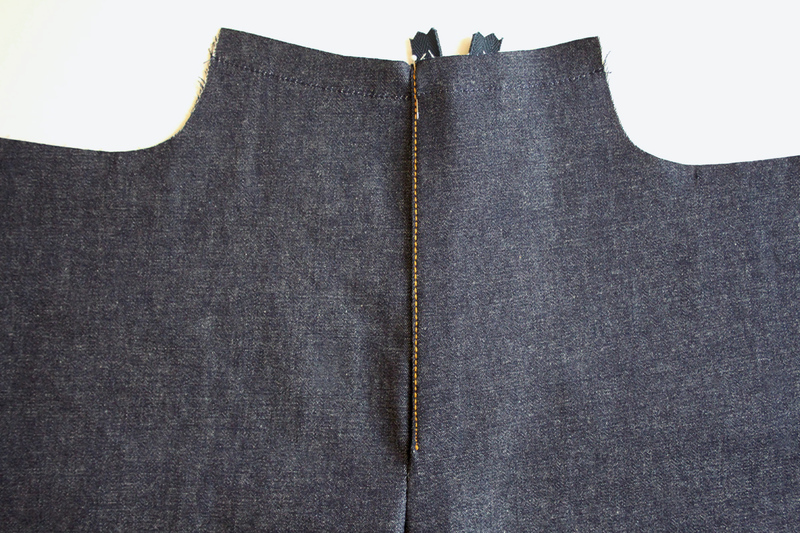 You’ll have two lines of parallel topstitching. Now we need to add some bar tacks. 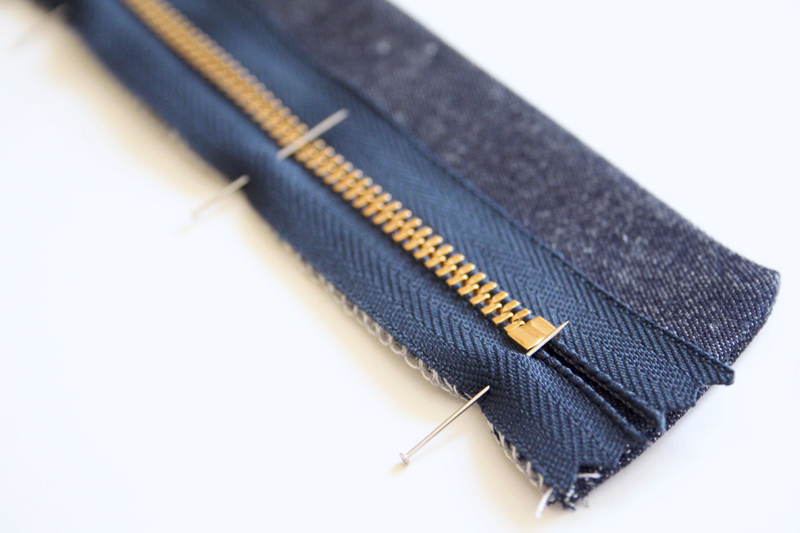 Bar tacks are just tight zig zag stitches sewn with topstitching thread. 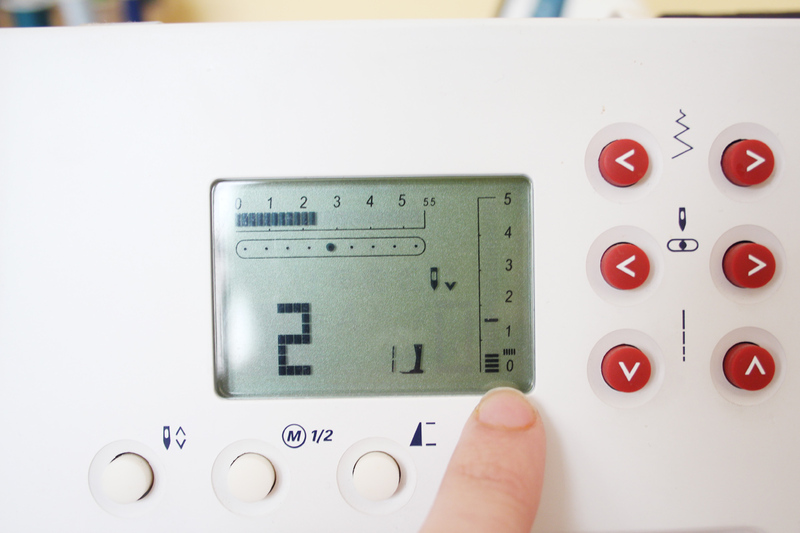 They are used on areas with a lot of stress, for added reinforcement. 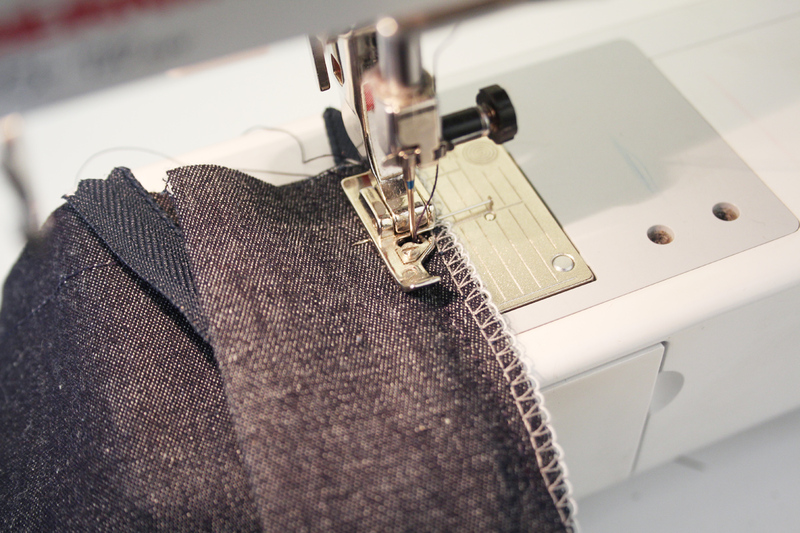 To set your machine for a bar tack, choose your zig zag stitch setting. 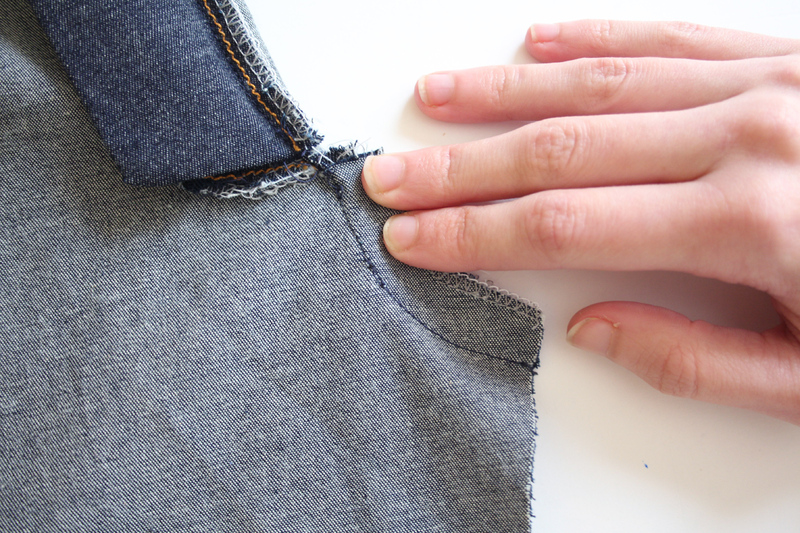 Then lower your stitch length. Not all the way, just lower than a normal zig zag stitch. My machine has a little mark (see above, just above the zero) to indicate a bar tack setting. But after some testing, I went just a bit below that. 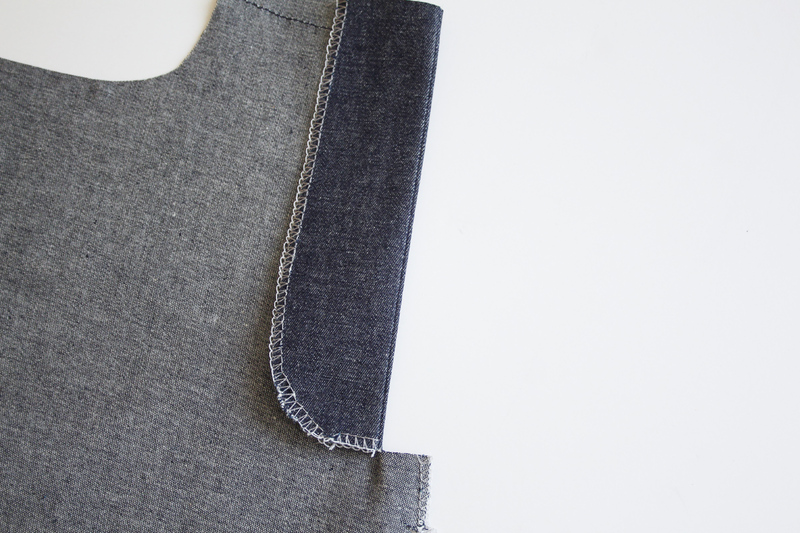 So make sure you test some bar tacks out on scrap denim before doing it on your garment. 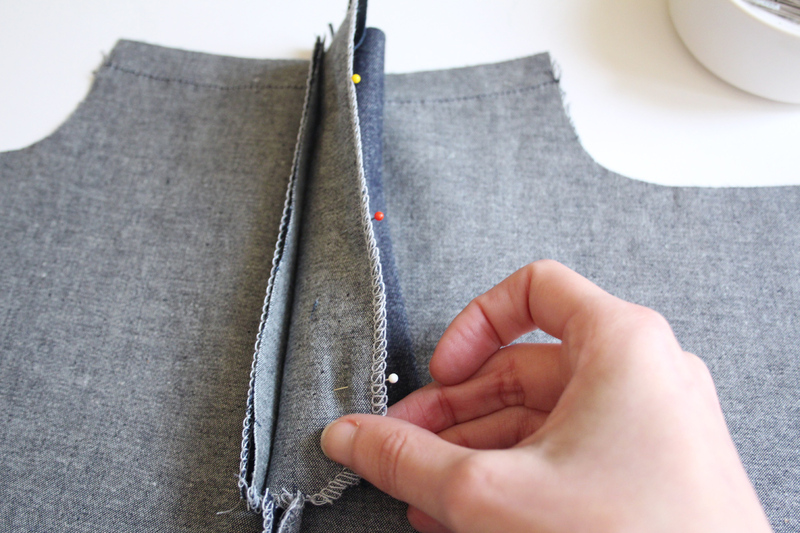 Sew one bar tack along the 1/4” horizontal line of topstitching that connects the two parallel crotch topstitching. 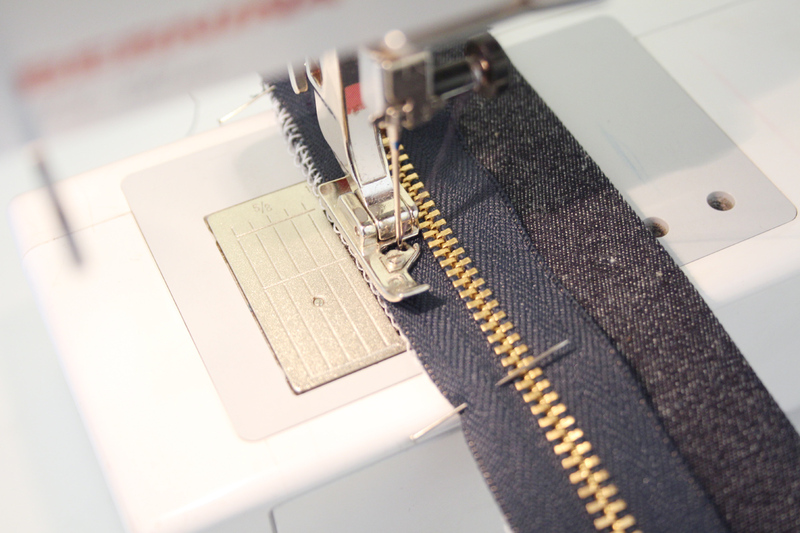 Sew another bar tack along the inner line of topstitching of the fly, just above where it begins to curve. That’s it! You’ve installed a gorgeous jeans fly front!